After taking forever to get to any kind of point, SON OF GODZILLA eventually settles into insulting our intelligence with a mindlessly boring story of a “baby Godzilla” hatching, and its mother?/father? 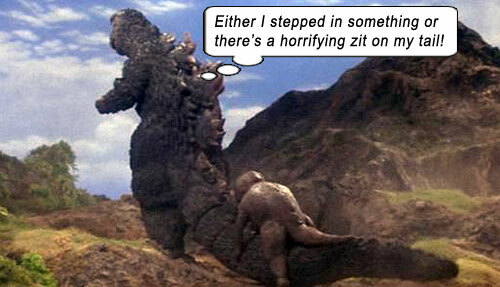 Godzilla protecting it from predators and teaching it The Way Of The Rubber Suit. Shin’ichi Sekizawa proves his utter incompetence as a writer, and Jun Fukuda proves the same as director – which effectively got them work as Japan’s foremost team on churning out at least six more Godzilla films in the late 60s into the 70s. Japanese scientists on an island (which will eventually be identified as THE “Monster Island” that would appear frequently in Godzilla movies) are experimenting with the weather. And with our patience. Almost one hour into their pointless tinkering something continues to not happen. A Reporter parachutes onto the island from out of nowhere for no reason, merely as a foil so that Head Scientist can exposit to him about the weather station, then Reporter is tweaked into the Hero, rescues the Girl and continues to annoy us by being in the film. I can’t tell the difference any more. 3) He’s prepping for the role of an obese trailer park monster for his next film (i.e. Honey Booboo’s mother). In keeping with the child-friendly nature of Godzilla in the late 60s, his son Minilla (or Minya, or Minira, as the monstrous-looking child-monster is called) befriends the locals. Other monsters on this island (which would become a catchall location for dumping all Toho Company properties in time) are three giant mantises – dubbed “Gimantis” by the great and literate Reporter – and a spider named “Espika” or “Esa-Pekka Salonen” or something, which shoots alarming amounts of silly string at everything, not just prey that it intends to eat. Apparently, anything that moves sets off this creature’s silly string spinneret, which must be exhausting. These guys and their weather experiment! Godzilla destroys their facility, yet they somehow manage to doctor the weather successfully into freezing, enabling their escape from the island. Which means there must have been a helluva lot of redundant buildings and superfluous equipment in that facility. A ‘What Were They Thinking?’ moment. with other headpieces from the same era. Was it run over by a car and left out in the sun after it was washed? Snow pounds down, freezing everything, including Godzilla holding his ugly little son paternally, buried alive under the unending tempest. On the escape raft, Reporter says, “They’ll hibernate, I guess, and wake up when it’s hot again.” Oh, you know that, do you? Telling us weeping kids that Godzilla is not dying of hypothermia in a freezing embrace with his offspring. aka: KAIJÛTÔ NO KESSEN: GOJIRA NO MUSUKO. 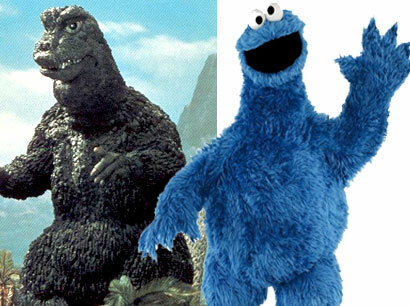 aka: MONSTER ISLAND’S DECISIVE BATTLE: GODZILLA’S SON. Writers: Shin’ichi Sekizawa, Kazue Shiba. Starring: Tadao Takashima, Akira Kubo, Bibari Maeda, Akihiko Hirata, Yoshio Tsuchiya, Kenji Sahara, Ken’ichirô Maruyama, Seishirô Kuno, Yasuhiko Saijô. GODZILLA: Haruo Nakajima, Seiji Onaka, Yû Sekida. MINILLA: ‘Little Man’ Machan.